A Visit to Ellis Island | Kid Reporters' Notebook | Scholastic Inc. Between 1892 and 1954, millions of immigrants to the United States passed through Ellis Island on their way to a new life. Visiting Ellis Island in Upper New York Bay is like stepping back in time. The huge hallway that greets visitors looks much the way it did a century ago, says Katherine Craine, the National Park Service Education Specialist for Liberty National Monument and Ellis Island. A visitor sees the wooden benches (some now replicas) where tired immigrants once rested, and trunks that came on steamships across the Atlantic Ocean. 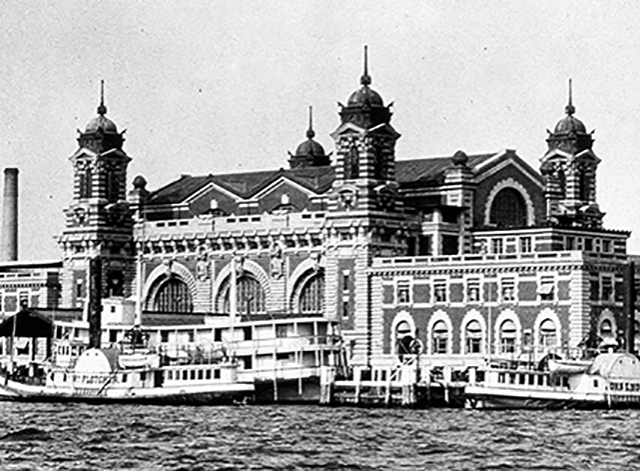 Ellis Island served as an immigration center from 1892 until 1954. An estimated 12 million people passed through the center, where they were given medical exams and had their documents checked before entering the United States. Almost half of all Americans can trace their ancestry to immigrants who came through Ellis Island. The reality, however, was sometimes different, says Barry Moreno, a historian at Ellis Island’s museum. People from several countries were not allowed into the U.S. simply because of their ethnic or racial background. The Chinese Exclusion Act of 1882, for example, officially barred Chinese workers from the U.S.
“Many [Americans] felt threatened by Chinese workers because they were very industrious,” Moreno explains. Since the Chinese dressed and spoke distinctively, Moreno adds, “they were always easily spotted by jealous or racist Americans.” The law was overturned in 1943, but the Chinese and other groups continued to face prejudice. Ellis Island has housed the immigrant museum since 1990. However, Hurricane Sandy flooded the island in October 2012, causing so much damage that the museum had to be closed for a year. Now, with the museum reopened, Giuriceo and others are helping to make Ellis Island better than ever. See excerpts from Joshua’s interviews with historian Barry Mareno and exhibits specialists who helped restore the museum after Hurricane Sandy.